In her highly original new novel, Molly Gloss delivers a rare blend of heady cerebral satisfactions, gorgeous prose, and page-turning adventure” (Karen Joy Fowler). 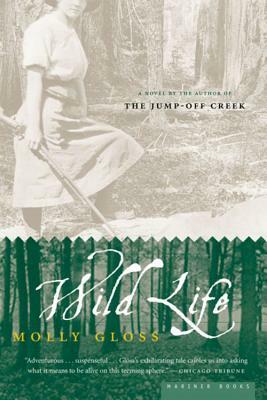 Set among lava sinkholes and logging camps at the fringe of the Northwest frontier in the early 1900s, WILD LIFE charts the life  both real and imagined  of the free-thinking, cigar-smoking, trouser-wearing Charlotte Bridger Drummond, who pens popular women’s adventure stories. One day, when a little girl gets lost in the woods, Charlotte anxiously joins the search and embarks on an adventure all her own. With great assurance and skill, Molly Gloss quickly transforms what at first seems to be pitch-perfect historical fiction into a kind of wild and woolly mystery story, as Charlotte herself becomes lost in the dark and tangled woods and falls into the company of an elusive band of mountain giants. Putting a surprising and revitalizing feminist spin on the classic legend of Tarzan and other wild-man sagas, Gloss takes us from the wilds of the western frontier to the wilds of the human heart. Never has there been a more authentic, persuasive, or moving evocation of this elusive legend: WILD LIFE is a masterpiece” (Kirkus Reviews).